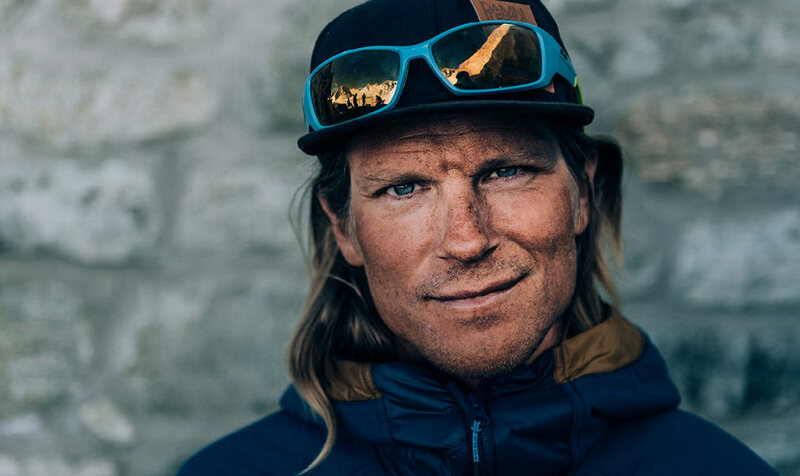 Taking the step from childhood holidays in the mountains to becoming a mountain guide in the Alps may seem long, just like the move from junior ice hockey in Stockholm to the top league in France. With a not insignificant amount of determination, Tobias Granath has made his teenage dreams come true. Meet a father-of-four and Elevenate friend who alternates family life in Engelberg with adventure among Europe’s highest mountains. His ice hockey career was shelved a long time ago. But still – it is unusual for a Swede to play with one of the top teams in France. It says something about how focused Tobias Granath is, that he succeeded in working his way into a team in the top French league. “I was fascinated by mountains even when I was little. I dreamed of being a ski bum and when I was on a high school ski trip I watched an ice hockey match with Chamonix. Because I played hockey at a high level, I realised that this was the perfect combination,” he says of the reason why he played for Chamonix HC & Mont Blanc Avalanches from 2003 to 2009, in parallel with checking off extreme rides on the peaks around this classic alpine resort. His skates have now been put away, but not his skis. It is late summer in Engelberg. Tobias has just dropped off the children at school and walked the dog, a twelve-year-old female mongrel that moved with the Granath family from Chamonix, via Edsåsdalen (close to Åre, Sweden) and then to Switzerland. 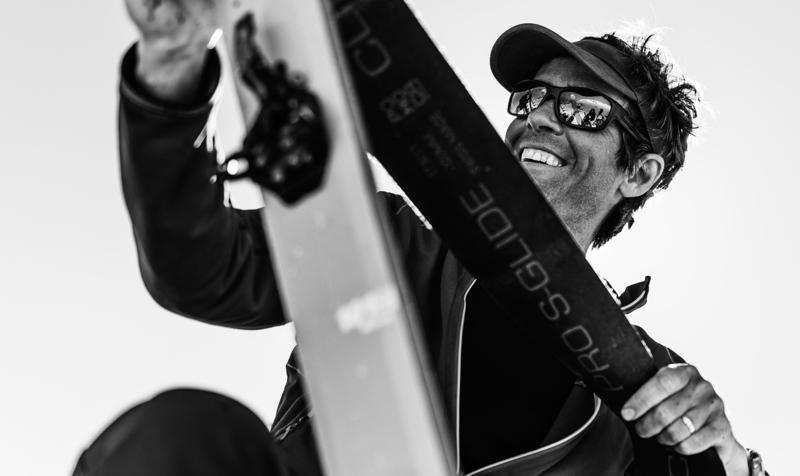 Engelberg is his home base, the place he returns to between jobs as a mountain guide. Getting to this point has been a long journey, with years of hard work to puzzle together guide qualifications, young children and finances. He describes the time in Edsåsdalen, where the family moved so the children could go to school in Sweden, as “one big blur”. In addition to his guide qualification, he also studied sports coaching at university, as something to fall back on “if it all went wrong”. But it hasn’t. Quite the opposite. Four years after qualifying as a guide, Tobias has a group of dedicated clients and things are going well. Intensive periods when he is almost non-stop in the mountains are mixed with quieter periods when he devotes himself to the family. Engelberg is in the heart of the Swiss alps. 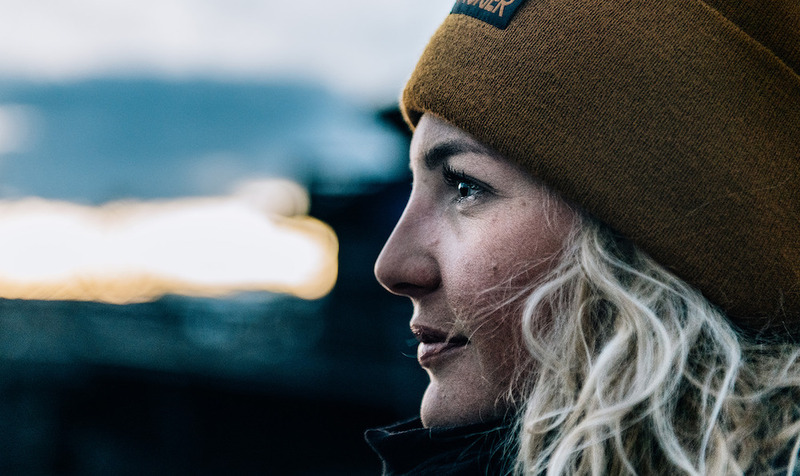 The resort has guaranteed snow and has gained something of a cult status among Swedish freeskiers, while being quite anonymous internationally. It’s a good place to bring up a family, if you ask Tobias. His wife Malin works with bookings at a hotel in the village. She was the one who initiated the move here four years ago, when she applied for and got a job at another hotel. “We had talked about the Alps, but suddenly it happened lightning fast, in just a week. I was a trainee guide at the time and was in Chamonix. I didn’t travel home to Edsåsdalen before the move, just hired a moving company that packed everything up. Malin did well to fix everything,” he says. The respect and affection for his partner can be heard clearly in his voice. Living a family life like theirs requires cooperation. 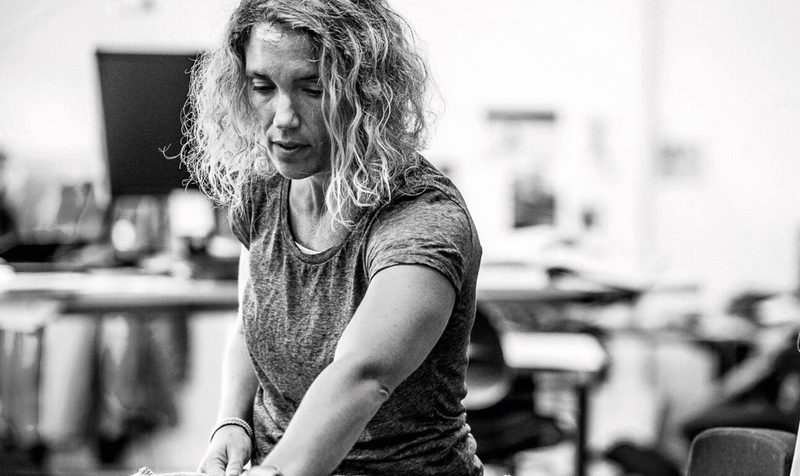 Malin has worked in seasonal jobs her entire professional life, explains Tobias, so she knows what it’s about. How have they made it work? No one protested about moving to Switzerland either, even if their daughter, who was seven at the time, was a bit sad about leaving her friends. But things turned out well, both with the new country and new language. The family had a Swedish au pair for the first couple of years so that daily life was manageable. Things turned out well for Tobias too. He’s now living the life he dreamt of as a teenager. In the mountains, with the changes of the seasons. “From December to March I work like a normal person, 8.30 am to 3 or 4 pm, almost every day. 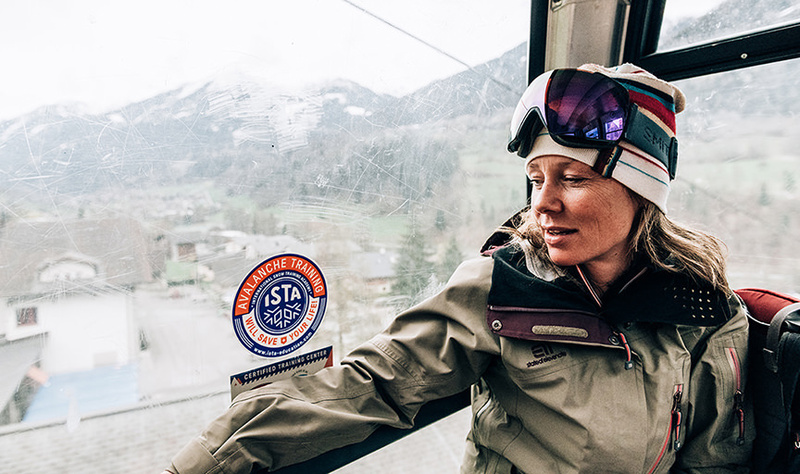 I take guests freeriding or ski touring in Engelberg,” he says, apparently unaware that his definition of “normal” is a little different from other people’s. 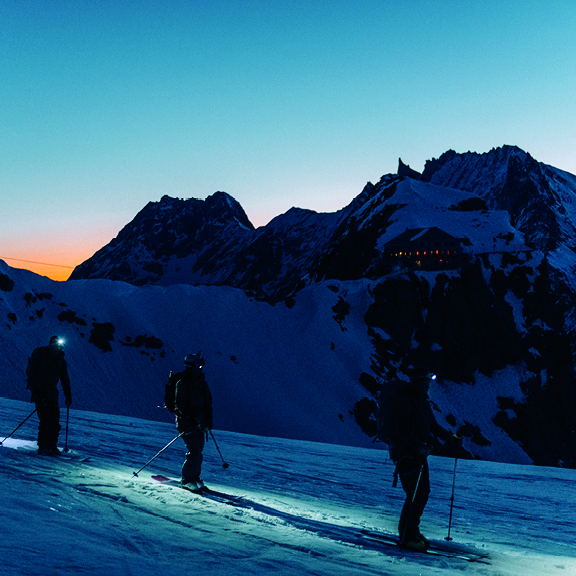 The classic ski touring season starts in the middle of March. The summer is about climbing, with the peak season in July and August. Then too, he spends many nights in huts with guests. He explains that you have to do this if you want to climb in the Alps, you can’t take the lift up and think you can start at 9.30 in the morning. Early starts are essential for a safe outing, before the thunderstorms that are so common in the Alps roll in in the afternoon. Tobias is actually a little surprised that he likes his summer jobs so much, it wasn’t something he took for granted with his ski bum background. But he appreciates the flexibility, finding new routes that suit the conditions, and he enjoys the contact with his guests, inspiring them and giving them an experience of the mountains. The physical element is another reason he likes his job; being outside all day provides continual endorphin highs. He says that sometimes it can be a bit too intense, almost like a Vasaloppet ski race every day for weeks. He benefits from his background in ice hockey in these situations, as he knows the importance of sleep, food and pre-season training for it to work in the long run. The pull of the mountains is as strong as ever, and on top of that he has almost daily confirmation that he’s done the right thing. “Hearing a guest say that this was ‘the best day of their life’, that’s such a kick, and it’s special to hear it every day! But I feel the same way: when we climb a great route, the sun rises and there’s no wind. I get to enjoy such amazing moments,” he says. Tobias has been an Elevenate friend since 2011 and uses our garments every day, both on the mountain and at home. Any mountain guide can help you achieve a summit you’ve dreamt of, but when you find a guide you are comfortable and secure with, you can get even further. The more you get to know each other, the better your guide can maximise the days according to your level of skill, ambition and the conditions in the mountains. 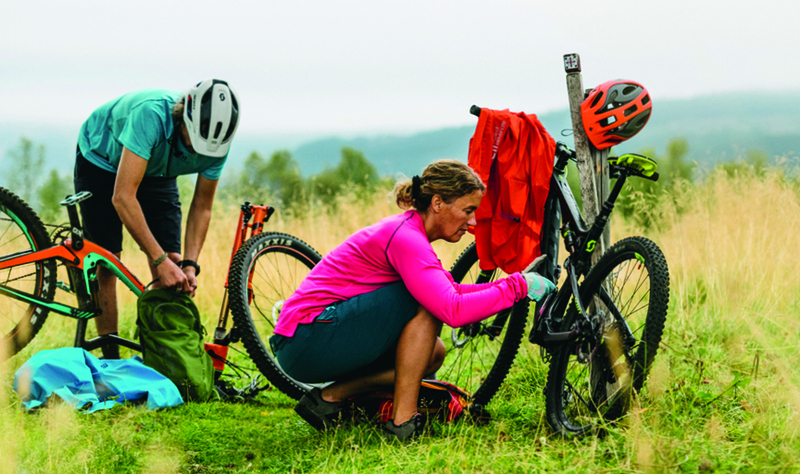 Think about your guide as your personal trainer or running coach – just like in the gym or on the trails, a guide can boost your technique and help you improve your skiing and climbing. Use agencies. Personal chemistry is important, it provides a foundation for development when it works. If you’ve never hired a guide before you can talk to a guide agency – they have traditionally had the role of linking guests with the right guide. Remember: if it feels good, it is good.